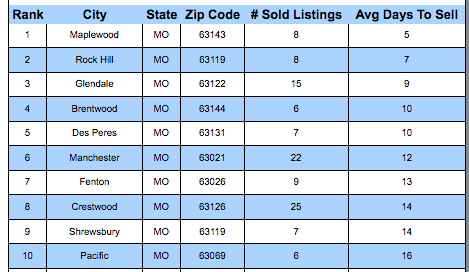 During the month of July, the homes that sold in Maplewood, Missouri took a median time of just 5 days to sell making Maplewood the fastest SOLD city in the St Louis MSA for July 2018! For July, the two fastest selling cities in St Louis took less time to sell than the number 1 city on June’s list (Columbia, IL at 9 days). Considering the sales that closed in June were from contracts executed during the spring market, we would expect the time to sell to be low, but the time to sell for July’s closings didn’t slip much. In fact, for the 10-fastest-selling St Louis cities on our list this month, the median time to sell is 11 days, a day less than June’s median time of 12 days for the top 10 list. For the overall St Louis MSA as a whole however, there has been a slight increase in time to sell going from a median time of 12 days in June (yes, the overall median was the same as the median for the top 10 (wow!) and for July it is 14 days.